The James JVP180 is the smallest and lightest in the Numatic homecare vacuum cleaner range. James weighs in at just 5.2kg, compared to Henry's 6.6kg, and comes with the lighter aluminium tubes. But don't mistake James's light weight for lack of capability - he comes with an 1100W motor and cleans to professional standards. Unique to James is the caddy top - somewhere to carry your cleaning items such as duster and polish while you're cleaning and also a place to store the power cable when you're not. James uses giant Tritex filters and the new Hepaflo dust bags. James is normally supplied with what Numatic call "Accessory Kit JV1". The JV1 kit metal components are made of aluminium. When buying your James you want to make sure you find a good supplier. Online it can be difficult to know which suppliers you can trust but that Amazon have done a great job of bringing together a number of quality resellers into a single website. What's more they have some of the best vacuum cleaner prices and provide the security of buying from a well known and trusted company. So I have included a James product link to Amazon on this site which displays their current price. 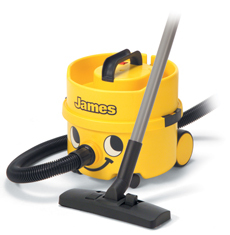 Simply click on the link to purchase your very own James Vacuum Cleaner.